The ROS-I Americas consortium hosted its third training event of 2018 at Southwest Research Institute on November 13-15. The three-day workshop was led by Dr. Josh Langsfeld, Joseph Schornak, and Michael Ripperger and attended by 16 participants hailing from diverse backgrounds across academia and industry. The curriculum was split into Basic and Advanced tracks, and alternated between slide-driven lectures and hands-on coding exercises. On Day 1, students in the Basic class were introduced to core ROS concepts like nodes, messages, services, and parameters, while the Advanced class developed a Python-enabled perception pipeline and explored introspective debugging tools. Dinner following the Day 1 session was hosted at La Gloria in San Antonio’s Pearl district, where attendees contended with six courses of tacos and tortas. The two classes reunited on Day 2 to develop a perception-driven planning application for a simulated robotic workcell. 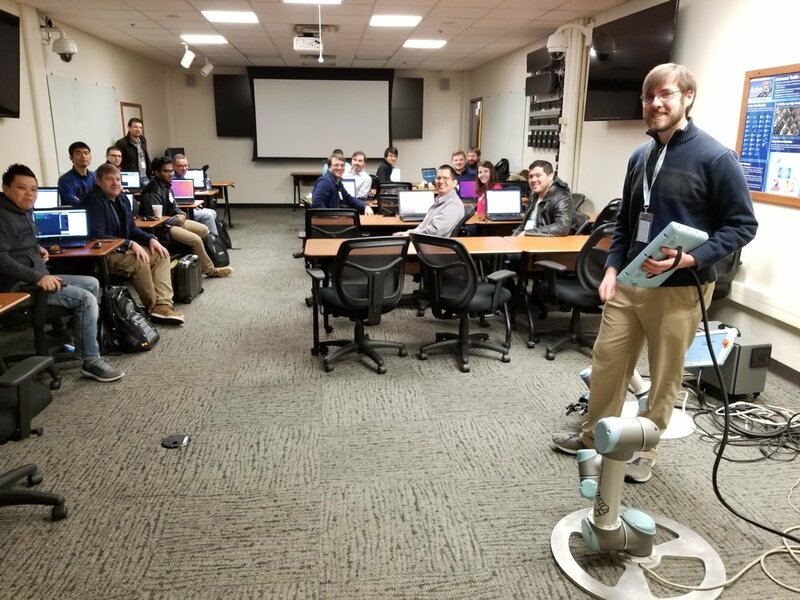 On Day 3 students were free to independently pursue a variety of open-ended lab exercises, including developing a more advanced pick-and-place application and adapting their programs from previous exercises to run on an actual UR5 robot. The ROS-I initiative is currently working on a migration to Melodic that will include the training exercises and curriculum for an initial unveiling in early 2019. Also under consideration for early 2019 is an introductory ROS2 advanced topic. Please reach out to us if you have any suggestions for improvements or additions to the lectures or exercise. We really enjoyed working with you and we hope to see you again!